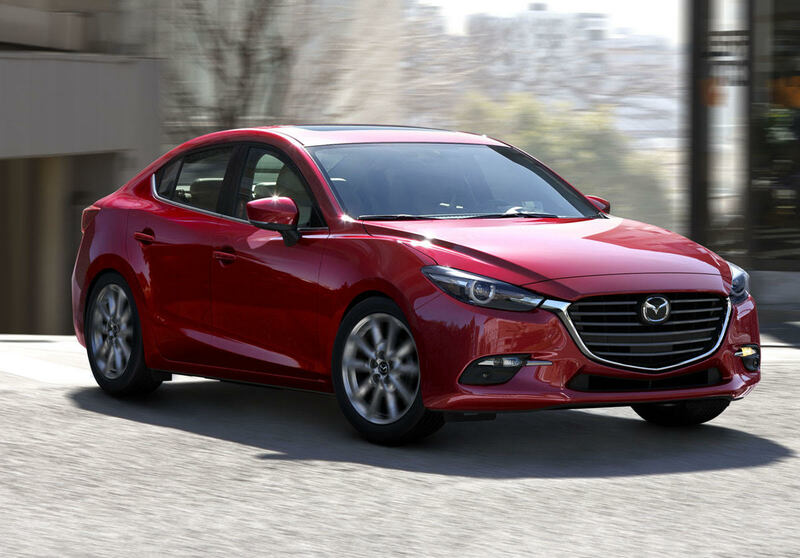 DETROIT – After test driving several Mazda hatchbacks and crossover models, a Mazda3 sedan finally showed up at the door. I found this four-door just as sporty and responsive as its hatchback counterpart. I had the 2018 Mazda3 4-door Grand Touring in Mazda-speak. What that meant was a 2.5-liter four cylinder engine that made 184 horsepower and 185 pound-feet of torque at 3,250 rpm. It was mated to a six-speed automatic transmission with manual shift capability, paddle shifters and the ability to be put into sport mode. This combination got 27 mpg in the city, 36 mpg on the highway and 30 mpg combined. The car had a long hood, short trunk and curved sheet metal over the front wheels. Standard on the touring trim line that I had were bi-LED headlights with auto leveling, LED taillights and LED DRLs and a body colored rear deck spoiler. This was a great looking package and an able sedan. Acceleration was pretty good, although a bit more oomph could have come if the maximum torque was reached at a lower rpm. Still, the Mazda3 sedan had enough power to get out of harm’s way on the expressways, if need be. What’s more, it could keep pace with traffic. A really bad stretch of Outer Drive here is being repaved; it should have happened years ago, the Mazda3 sedan turned what would have been a rib rattling ride into a severe bumpy one. The car cornered well and it was relatively quiet, although I could hear a little engine drone from the four–cylinder. A little more soundproofing would not have hurt. Mazda has always been adroit at two tone interiors. The layout was simple, clean and intuitive. Although for a channel changer like me switching radio stations was a little cumbersome. There was a large circular odometer in front of the drive with digital speed readout in the lower right side of the circle. Speed would also be shown on what Mazda called an active digital display. It’s a heads up display but it is not on the windshield, it is on a clear arced pane that comes up on the steering wheel column in front of the driver when the engine is started and flips down when the ignition is shut off. Wings off each side of the main circle instrument held the temperature gauge in one and the fuel gauge in the other. I thought it neat that at this price point, less than $30K, the 2018 Mazda3 sedan had heated front seats and a heated steering wheel. There was also a moonroof and rain sensing windshield wipers. Though it was a little bit of a scrunch to get in the back seat, there was plenty of head room. Two people could be very comfortable but three abreast, not so much. Amongst the changes for 2018, Grand Touring models like my test vehicle have18-inch wheels and a leather interior. Mine was parchment (eggshell white) and black. My test car had Bluetooth, a rearview camera with cross traffic alert, satellite radio, USB and auxiliary jacks, text message delivery and reply and push button lock and unlock as well as push button start and stop. For $27,070, the 2018 Mazda3 was a nicely equipped sedan.